Brown Ring Patch (aka Waitea patch) is starting to show up on golf course putting greens at this time. This disease is caused by the fungus Rhizoctonia circinata var circinata and typically develops during warm weather from April through June. Symptoms start as small yellow rings (0.25-2 inches wide) with green grass in the center and can ultimately reach a foot or more in diameter. The yellow rings can turn an orange or brown color as the disease progresses. Although the disease rarely kills turf, affected areas are extremely slow to heal. For best results, apply Medallion, polyoxin-D (e.g., Affirm or Endorse), ProStar, one of the QoI fungicides (e.g., Heritage or Insignia), Trinity, Triton Flo, or Torque now and repeat in two to three weeks to limit disease development later this spring. Unlike yellow patch, the brown ring patch fungus can degrade the thatch in infected areas so several fungicide applications are typically required to prevent significant damage. Seedhead suppressants (e.g., Proxy + Primo) may enhance disease severity. Therefore, be sure to initiate a preventive brown ring spot fungicide program in areas where this disease has been troublesome and seedhead suppressants have been applied. 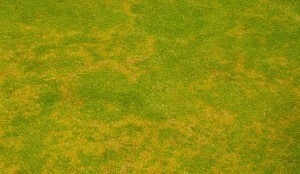 For more information on brown ring patch see, Reducing brown ring patch severity on Poa annua greens.